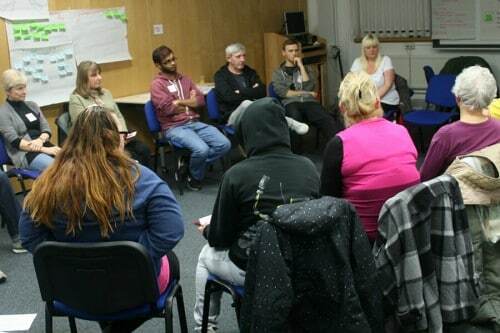 These deliberative processes involve local residents, citizens and service users in discussing, hearing evidence and making proposals around often highly contested issues of public policy. Following best practice learnt over many years, they produce insightful results that would not be achieved through a consultation, focus group or survey. In addition, the process nearly always produces a group of enthusiastic motivated residents interested in taking action. A ‘jury’ is typically made up of a group of around 20 diverse people selected ‘at random’. In an informal and relaxed setting members of the jury share knowledge, expertise and opinions before questioning a series of ‘commentators’ (also known as expert witnesses) — specialists they have called to provide different perspectives on the inquiry topic. Where possible the ‘jury’ seeks consensus before collectively producing a set of recommendations that are shared widely and action planned at a stakeholders conference. Thereby influencing public policy or the commissioning of public services. Shared Future can facilitate Inquiries on a huge range of topics. In fact, on any topic. As the facilitators we stand apart from making recommendations, and see our role primarily as supporting the quality of the deliberation and making sure best practice is followed. Our associates, led by Peter Bryant and Nick Beddow, have tackled many Citizen Inquiries in their extensive careers. Our testimonials page points to how well they have been received by commissioners. In 2013 and 2014, Shared Future ran the Morecambe and Fleetwood Alcohol inquiries. We’ve since facilitated the Wirral Alcohol Inquiry and a Citizens Jury for the West Midlands Mental Health Commission, and into Fracking in Preston. In 2017 Shared Future released the first report of the Central Blackpool Health and Wellbeing Inquiry. This has led to many more inquiries being run across all areas of Blackpool, focussed on remodelling Community Orientated Primary Care and building a culture of co-production, work that is ongoing. More recently we completed the Greater Manchester based Inquiry into Care at Home, and Our Voice Inquiry into Shared Decision-Making in Scotland. In 2017 we also completed a significant literature review into best practice in citizen deliberation. We completed a Citizen Jury in Hastings in early 2017 on the theme of alcohol harm reduction, and are continuing, in 2018, to work in Blackpool on the theme of remodelling community orientated primary care. These were all led by Peter Bryant, who has worked on more than 20 citizens jury style processes over the last 10 years, on a variety of topics including alcohol harm reduction, access to healthy food, nanotechnology, well-being, living in rural areas and on improving the community engagement of public bodies. And we are soon to begin an innovative adaption, or inversion, of our proven citizen jury model, to engage with health professionals in a redesign on the ‘Care at Home’ system in Greater Manchester. Read reports of our Citizen Juries work.